I’ve teamed up with Warner Bros. this month to bring you all a ‘Get The Look’ post* inspired by a super stylish and quirky new character: Louise Clark, from the upcoming release Me Before You - a heartbreakingly romantic film based on the critically acclaimed novel by JoJo Moyes. The film is out this Friday! Louisa is super-feminine but isn't afraid to mix up styles, prints and textures. Her standout dresses were floral, full and a nod to the 1950's but kept modern with her eye for accessorising. It's the season for dresses and if you want to nab a similar style be clever when shopping around. Lou (and the actress herself) are petite so it's wise to choose full dresses and skirts cut especially for a smaller height so you don't drown yourself with too much material. Bumble-bee tights play quite a part in the film (I won't ruin anything, don't worry) so I kept a keen eye on anything just as unique, loud and somewhat eccentric as her. Her faux fur stripe coat tended to go wherever she went and looked amazing with whatever she wore. The monochrome didn't overtake any of her pieces and kept her from looking too OTT - if that's even possible for Louisa? Lou's yellow rain mac was my personal favourite clothing items of hers. I've seen them all over the high-street lately and surprisingly enough, the colour goes with most things - they're ideal for festival season! She layers her beloved print sweaters with crisp white shirts or collars but adds a casual twist by matching them with a floaty skater skirts and her essential wellies. I couldn't help but obsess over Louisa's accessories - her choice of shoes and bags in particular were so, so fun. Her outfits added a much-needed lightheartedness to the film, especially when things got really emotional. 'More is more' is most definitely her style mantra and something many of us should adapt and embrace for a little extra sunshine in our wardrobes. The film itself? Incredible. 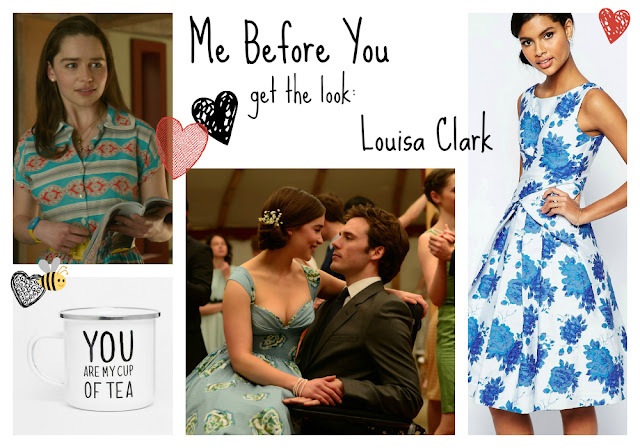 If you're a sucker for romance, with dry humour and some essential eye-candy (hello Sam Claflin), then you'll adore it! I cry at generally anything emotional and needless to say my mascara was around my ankles by the end of it. See the trailer here for a sneak-peak.